E-sports is a fast paced, rapidly growing industry. Classically filled with tech savvy individuals, a large part of the League force contains many of the best and brightest of our generation. Many players will grow up to enter the work force outside of the e-sports arena, some wondering if they should give up gaming as a part of entering adulthood. The answer of course, is no. You should definitely continue on your gaming path, not only to relieve stress, but also because playing League may actually INCREASE your success in real life as well! One of the major driving forces behind success is the will to succeed. Playing League means that in every game, you have a goal that you're driving at. You learn to accept losses as they occur, but to also strive for victory, utilizing many of the skills listed below. The ability to work in teams is almost always on the Top 5 if not at the very top of every potential employee's required skillset list. Besides the occasional "1v1 me bro", League is a game where teams comprised almost entirely of complete strangers must learn to work together and accomplish objectives. Although some players may resort to poor forms of communication, most players eventually realize that they need to be a bit more diplomatic to get their point across. Even if they don't, they provide valuable lessons for other people; this brings me to point #3. If you've never played with a difficult person in a game then I welcome you, oh slayer of bots (although that Annie Bot does get a little feisty). The ability to deal with difficult people across a large variety of age groups is a big boost to your communication skills. Keeping a level head when dealing with the worst of people goes a long way in life. Should you buy the cheap stuff or save up for something with a bit more quality? Do you buy an extra Doran Blade or save up for a BF sword? Do you spend all your RP on the new project skins or wait for a sale? The same questions that you find on the rift also mirror themselves in real life. This isn't to say that one way or the other is always correct, but it means that you become used to thinking of financial matters from a logical perspective. For some people, dealing with difficult people (#3) is as simple as muting them in-game. However, conflict resolution takes it a step further. Enemy team members you can mute, but what about if they're irritating your teammates and disrupting their concentration? Conflict resolution is a difficult task, but also one that can boost your ladder ranking significantly if you do it on a regular basis. Similarly, people in real life will greatly appreciate people who can quickly quell conflicts and re-establish productivity in a workplace environment. Think there's nothing more mundane than stamping documents? Recall back to all the time you spent watching tiny health bars drop and trying to right click just before it hit 0. If you think of it like that, it seems some of these mundane tasks could potentially one day be interesting. Joining a ranked team means coordinating everyone to be online at the same time, which is far easier said than done. Successfully forming a ranked team and playing together (even if you lose all the time) is still a worthwhile task. It makes you realize that everyone has their own agendas every day, and that respecting other people's time is crucial to the success of a team. Continuously running into a wall generally results in rapid realization that other tactics are necessary to get around it. In the fast paced environment of League of Legends, players are continuously formulating micro and macro level strategies to win games. By adjusting proven strategies that have worked in the past, players can adapt to nearly any situation and learn from failure. This translates over to how most of the workforce operates as well. Any League player worth their weight quickly realizes the wealth of information available on the internet, especially on nerfplz.com (shameless plug). Surprisingly, many people don't know how to look for information, much less find it. However, to your average League of Legends player, the ability to research what runes to use or which new masteries to input come second nature. League players also research with a side of caution and healthy skepticism of sources, something that comes in very handy in the real world as you sort through all the junk out there. Lastly, League of Legends at its core is a social game. Despite the fact that players can choose to have nobody on their friends list, mute every player in the game and move the chat box off the screen, at its heart League of Legends is still a game you play with friends and strangers. Despite your best attempts, you'll eventually want to say something, and there a connection is formed. You find a common bond and realize that talking to complete strangers is actually relatively easy. Although it doesn't always translate to real world confidence, it's definitely a start. What do you think? Does League help in any other ways? 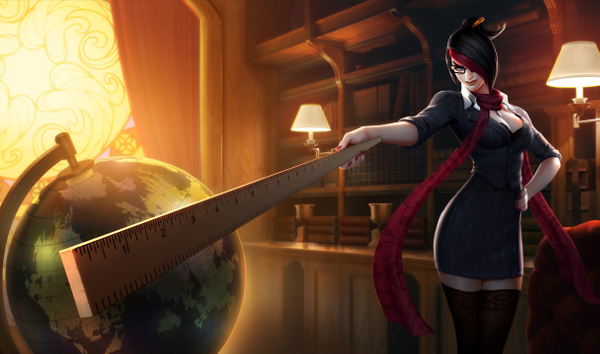 Are you skeptical that League is anything more than just a game? Comment below!